For questions or more information about any of our products and services, please email or call us at 877-843-0183. 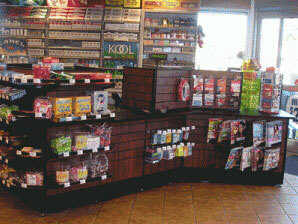 JayComp, convenience store design consultants, are pleased to be your first stop for convenience store design, walk in coolers and more! The Metal Cabinet System: Utilize an assortment of units to create a cabinet order that meets your precise needs. SHOPCO offers a full line of all-metal cabinets with choices such as: prep, low prep, beverage, condiment, waste and microwave units; stocked in white, beige and gray. All types of countertop fabrications are available: solid surface, stainless steel and laminate. You also have the option of stainless steel legs or metal bases. The all-metal components provide wide-ranging design opportunity, while preserving the durability and cleanliness of powder-coated metal, which makes the Metal Cabinet System ideal for QSR and retail food service applications!